How good are you at memorising messages? Probably better than you realise. I suspect over the years you have memorised hundreds and hundreds of messages. Lets test you. Let see how many of these messages you can complete, and for a bonus, who said it. Bread wi’ nowt …taken out: Allinsons. Now hands that do dishes can feel… soft as your face. Guinness is… Good for You. OK so we all watch too much television but do you see the power of a well-constructed message? Why do we remember these messages? Because they are simple, memorable, visual, sometimes humorous, but most important, they are convincing, they are true – mostly. All except the last one perhaps. What is the Christian message? Can it be summed up in one sentence? How about, “For God so loved the world that… he gave his one and only Son, that whoever believes in him shall not perish but have eternal life.” (John 3:16). If only evangelism were as simple as putting a verse like John 3:16 on a banner outside the Church. But marketing agencies know that it takes more than a memorable or witty slogan to make a successful company. Marshall McLuhan once said, “The medium is the message” McLuhan proposed that the medium itself, not the content it carries, determines the credibility and effectiveness of the message. That is as true in evangelism as it is in any other form of communication. People don’t care how much you know until they… know how much you care. In John chapter 3, we listen in on a conversation between Jesus and the religious leader Nicodemus. Jesus summarises the contagious Christian message. I want us to focus on three dimensions of this message in John 3:16-21. The way to new birth, the joy of new birth and the necessity of new birth. We know this verse so well, but can you remember the day you first heard it? How did you feel when you realised it was written for you? Imagine someone reading these words for the first time. What does it tell us about God’s love? A great deal. At least five things. 1. The Height of this love “For God so loved”. It is unlimited. 2. The Breadth of this love “so loved the world“. It is universal. 3. The Depth of this love “that he gave his only son”. It is unbelievable. 4. The Length of this love “that whoever believes”. It is unconditional. 5. The Duration of this love “but have everlasting life”. It is unending. An unending, present possession. Jesus did not say “hope to have everlasting life” but “has eternal life.” What does this mean? You cannot be too sinful, or too far gone in life, or too far away from God, for his love not to reach you. The height, the breadth, the depth, the length and the duration of God’s love. It is unlimited, universal, unbelievable, unconditional and unending to those who will believe. The way to new life. That is when you can tell the difference. There is deep seated joy in the hearts of those who realize Jesus died to rescue us. That he came to give us a new life, forgiveness for the past, and certainty about the future. ” there will be more rejoicing in heaven over one sinner who repents than over ninety-nine righteous persons who do not need to repent..” (Luke 15:7). “I heard what sounded like the roar of a great multitude in heaven shouting: “Hallelujah! Salvation and glory and power belong to our God” (Revelation 19:1). There is no greater reason for rejoicing than knowing that God our Father loves us and accepts us in Jesus. The Way to New Birth and the Joy of New Birth. Let me ask you a personal question, “Have you been born again?” Do you know for sure that you are forgiven because Jesus died for you? Do you know you have eternal life because Jesus rose again for you? If you are not sure, make sure today because there may not be another. “Human destiny”, Jesus is saying, “is ultimately determined by how people respond to me.” With a single exception, God will forgive a person absolutely everything. Whatever is on your conscience today, God will forgive it. You may have a harder time believing you’re forgiven but that’s another issue. The bottom line is this. God loves the world and does not wish to see a single individual perish. The gospel is as unlimited and as personal as that. But there is one thing he cannot and will not forgive. That is the arrogance, the ingratitude that refuses to receive his gift of forgiveness. You may not yet be a Christ follower. You will certainly have non-Christians in your family or circle of friends. Have you ever asked them why they are not a Christian? Have their intellectual questions gone unanswered? Are they waiting for a spiritual experience to zap them? Just too busy or can’t see the relevance? I would not wish to question the sincerity of anyone’s reasons for remaining an unbeliever. I would not be so rude. But Jesus would. He is rude enough to question our excuses, and sift out motives. And he does so right here. In these closing sentences of this conversation between Jesus and Nicodemus, just as the credits are about to roll and the studio lights begin to fade, Jesus says that all the popular excuses for avoiding Him are really just a smoke screen. Jesus insists that the real reason people do not believe in him is not because they have intellectual problems, it is not because they lack a religious experience, it is not due to busyness, or upbringing. The real reason is sin. People do not want to become Christians for one reason, and one reason only. Because they realise following Jesus requires a change of direction. And they do not want to change. People would rather sacrifice their integrity than lose their pride. They would rather stay in the dark, says Jesus, than move into the light. Jesus insists gently but firmly that such excuses do not hold water. Spiritual blindness is culpable. It is not that people cannot see the light but will not come into the light to see. This is the verdict on our world today. The light has come into the world but people prefer the darkness because their deeds are evil. We don’t know how long Nicodemus stayed to chat with Jesus after John put away his parchment. I expect it went on much longer. Could it be that they talked all night? Nicodemus arrived in the dark in more ways than one. Could it be that as they parted the first glimmerings of dawn were hovering over the eastern horizon? And did he smile, I wonder, at the rising sun – as the light dawned on him. Or did he turn his back on it, gluing his eyes to his own shadow? The shining of the sun inevitably casts shadows. To turn our backs on the son is to deepen the shadows. To refuse life is to chose death. To reject salvation is to invite condemnation. The issue is really quite black and white. The believer is not condemned, but the unbeliever is. What people think of Jesus Christ divides our world in two. There is no middle way. There can be no compromise. Such a choice confronts us all. We have listened in on this conversation between Nicodemus and Jesus, between the teacher of Israel and the Teacher. We have heard the evidence for this vital experience, about being born again. We have heard the claims for Jesus own uniqueness. The Son of God sent into the world to save it from destruction. So yes, it is good if we can memorise an outline of the Christian message and some key verses. 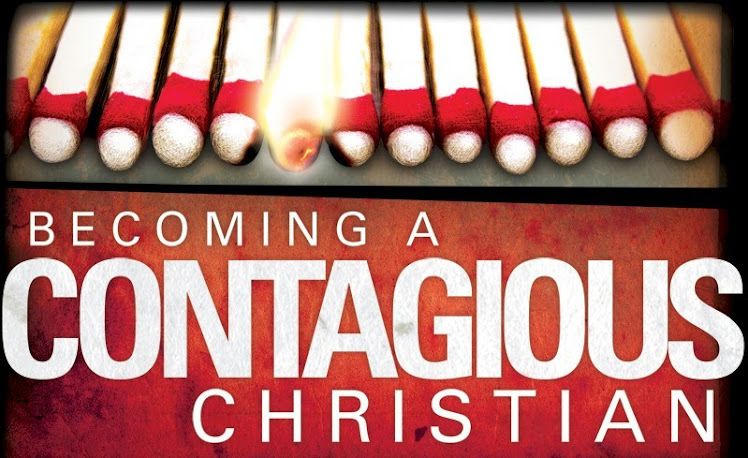 But when you invite family and friends to join our Christianity Explored Course starting next Wednesday lunch time and next Thursday night, remember that to be contagious Christians, the medium IS the message. Lets pray. This entry was posted in Bible, Evangelism, Sermons on April 26, 2013 by Stephen Sizer.